I can tell this will be the new game this summer. I’ve gone full throttle with the whole dumb thing, much to Little Man’s delight and confusion. Here are the dumb socks. 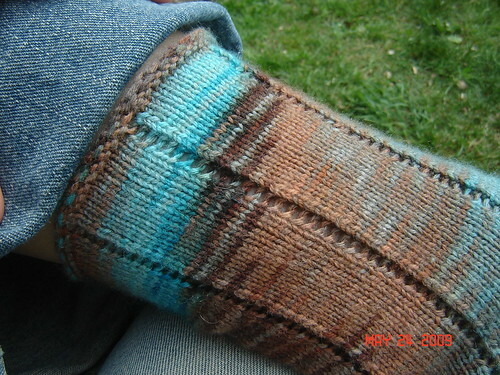 I have also knit another pair of even dumber socks, which I’ll show you in another post. lost the second ball of yarn for quite some time. 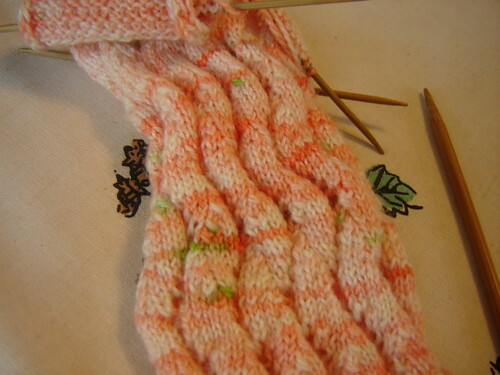 Size one needles, about 8 stitches per inch gives you a medium sock. Round one: k8, k2tog, yo. 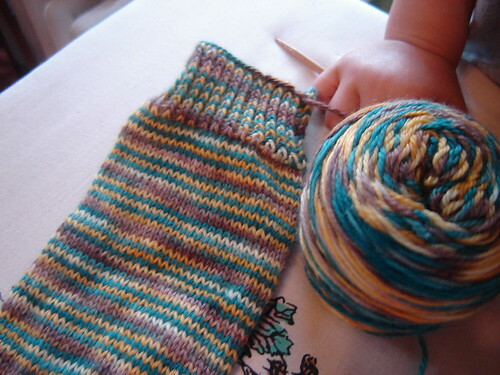 Knit a basic heel flap, continue the stitch pattern across the top and pick your favorite toe. I used the standard k2tog, ssk. 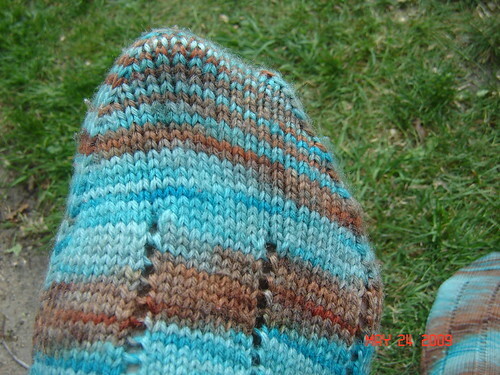 The sock yarn is from Sandy’s Palette. As for the whole “dumb” thing, I’m going to try the humor route with this one. Words like dumb, stupid and shut up have been favorites of Little Man’s lately. Some of it is from school, obviously, and it’s every kindergartner’s job to see how far he can go with certain words. (Believe me, he’s tried them all. Dumb is tame compared to what he let loose the other day). Aside from what he picks up on the bus, a lot of it has surprisingly come from books we’ve read…. Superfudge? It was a favorite of mine as a kid so I grabbed it from the library, but wow, the put downs really fly! We love to read here, and Little Man will sit and listen for ages to just about anything. I still love Fudge, but it is a bit of a bummer when it seems that every book written is full of name calling. Now, I’m not naive. Kids have been calling each other names for as long as there have been kids*. And I do believe that dumb, stupid and the like have their purpose. It just seems that when I compare The Secret Garden to Spiderwick (both of which are great stories) it’s a small handful of putdowns vs. dozens of them…. Not sure where I’m even going with this now. It’s late, I want to go knit. My point? I’m tired of shut up and stupid and dumb and all that jazz, but I’m going to play the game and try to have a bit of fun with my kids to get my point across. Which is why Little Man was totally confused today when I asked him if my new socks were more dumb, less dumb, or equally as dumb as my Copycat socks. And then I went upstairs and laughed like a crazy lady. 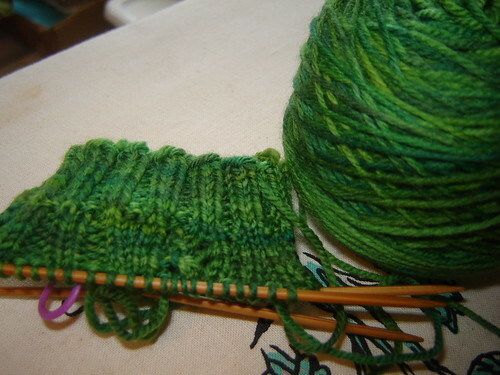 I do have some socks on the needles. I actually forgot about them until I started cleaning my workroom out, and guess what I found!! Now off to put up my swollen feet and enjoy a little Olympics and the early bedtime that both boys took tonight….